Phil Mickelson somehow managed to lose two holes for his team with one mistake on Friday at the Presidents Cup. How? Let’s try to explain. On the seventh hole of his fourballs (best ball) match taking with Zach Johnson against Jason Day and Adam Scott, Mickelson played a model of golf ball different than the one he used to start the match. That’s a violation of Rule 33-1 in the Rules of Golf, as well under Rule 5-1, defined as the One Ball Rule as a Condition of Competition. It means a player cannot use multiple models of golf balls in an attempt to gain an advantage as conditions change. Typically, the match-play penalty for violating a rule relating to playing the wrong ball is the automatic disqualification of violating player from the hole on which the mistake was discovered. In one-on-one match play, that means the loss of a hole. After consulting with a PGA Tour official, Mickelson picked up his ball. Johnson, flying solo, made par 5 on the hole and lost to Jason Day’s birdie to go 1 down in the match. So, how then did the U.S. go 2 down in the match? Mickelson and Johnson were penalized together for Mickelson’s Rule 5-1/33-1 infraction. A breach of a Condition of Competition leads to a change in the state of the match on which the breach is discovered, up to two holes. Since it was realized on the seventh, it was just a one-hole adjustment. So the U.S. lost the seventh twice, once in playing it and another through an adjustment penalty. However, PGA Tour chief rules official Mark Russell later told U.S. captain Jay Haas that Mickelson actually could have played out the hole, even with the wrong ball, in fourball match play. 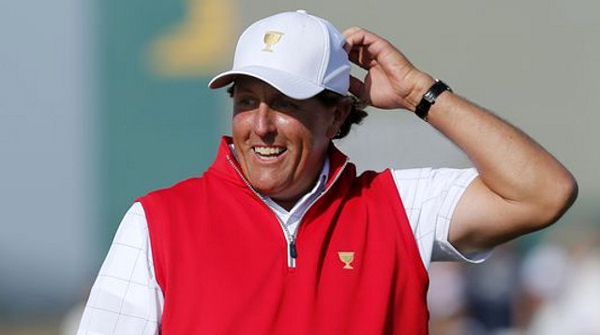 An official mistakenly gave Mickelson bad information in saying he should pick up. Under the Rules, however, there is no recourse for Mickelson to remedy the bad info, so the ruling stands — as wacky as it sounds.